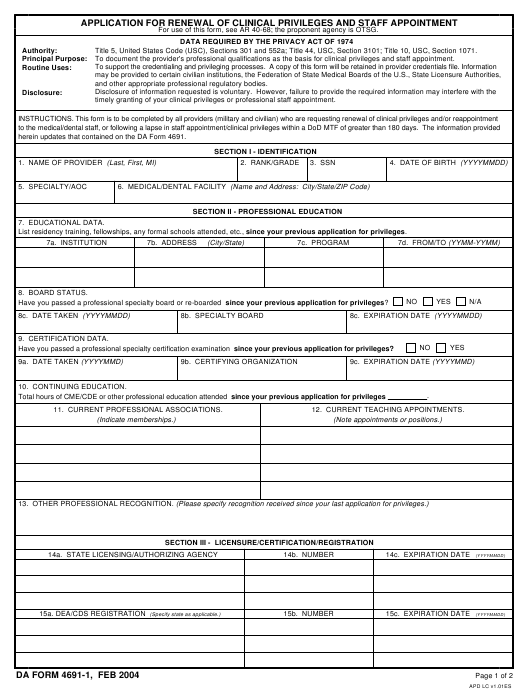 DA Form 4691-1 - also known as the "Application For Renewal Of Clinical Privileges And Staff Appointment" - is a Military form issued and used by the United States Department of the Army. The form - often mistakenly referred to as the DD form 4691-1 - was last revised on February 1, 2004. Download an up-to-date fillable PDF version of the DA 4691-1 below or request a copy through the chain of command. Title 5, United States Code (USC), Sections 301 and 552a; Title 44, USC, Section 3101; Title 10, USC, Section 1071. To document the provider's professional qualifications as the basis for clinical privileges and staff appointment. and other appropriate professional regulatory bodies. timely granting of your clinical privileges or professional staff appointment. herein updates that contained on the DA Form 4691. List residency training, fellowships, any formal schools attended, etc., since your previous application for privileges. Have you passed a professional specialty board or re-boarded since your previous application for privileges? Have you passed a professional specialty certification examination since your previous application for privileges? applying. I request renewal of my clinical privileges as specified on attached DA Form 5440-series appropriate to my discipline. 19. I request admitting privileges. 22. I hereby certify that the information contained herein is true, accurate, and complete to the best of my knowledge.